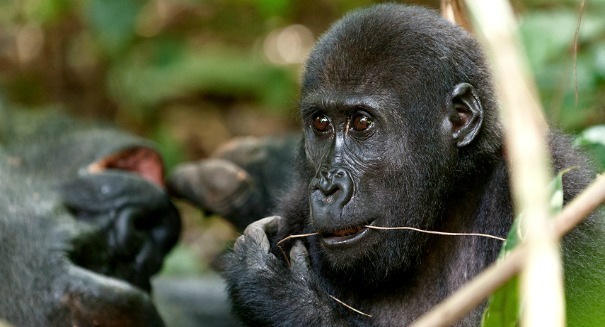 An incredible new finding may change how we think about apes. Scientists have found out something about apes that suggests that we may not be as special as we think we are. A new paper indicates that apes are able to understand the unstated thoughts and desires of others, something that until now it was thought only humans could do. A research team comprised of scientists from Duke University in the United States and Kyoto University in Japan watched 41 chimpanzees, bonobos and orangutans, showing them a series of videos including a regular person and one dressed like King Kong, according to a statement from Duke. King Kong would try to hide a rock-like object from the person, and if the person saw what happened, he’d find the rock, but otherwise, he would not be able to find the rock. Then, the scientists showed them extra videos where King Kong tries to hide in a haystack — sometimes the person saw him, sometimes he didn’t. Researchers used an infrared eye-tracker to see where the apes looked, which indicated to the researchers where they thought the human would go. They found that the apes were able to anticipate the person’s actions, even when the person was incorrect in figuring out the location of the rock.